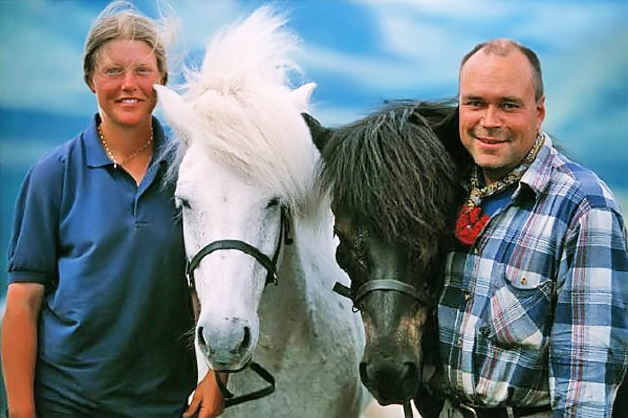 Malin and Osvald with two of Fjällhästen’s Icelandic horses. In 1986 Osvald changed his motorbike used for reindeer herding for an Icelandic horse. His body had suffered from the tough driving on the mountain. Now it was time to try a new and for the body more merciful way of making his way across the mountain. The Icelandic horse Grani was the first to come to Ammarnäs to assist Osvald with the reindeer herding. But keeping up with the motorbikes was tough. However an interest among visitors to Ammarnäs to join Osvald and Grani on mountain tours had aroused. The concept of the company Fjällhästen is born: to let guests take part of the mountain and Sámi culture with Icelandic horses as travelling companions. In 1987 the first tours depart into the Nature Reserve of the Vindel Mountains and the Jonsson family’s old Sámi lands. Today the company consists of 10 Icelandic horses and two guides: Osvald Jonsson and Malin Johansson. Fjällhästen offers both shorter horseback riding tours and weeklong expeditions through Lapland’s magnificent mountain world. Several of these events are founded on a trust from and cooperation with Gran’s Sámi village. Fjällhästen is also an enterprising force in Destination Ammarnäs , a non-profit organization working to improve the village’s sustentation conditions. You find more information about Ammarnäs at Ammarnäs’ website. At Västerbottensturism there is information about the county’s tourist enterprises. Since the endangered arctic fox has one of its most important species within the Nature Reserve of the Vindel Mountains it’s obvious for us at Fjällhästen to support and assist with the project Fjällräven for example with monitoring, inventory and deliveries of for example forage. We inform our guests about the arctic fox’s situation and those who want to can support the project by depositing money in a giro account.